Before we can talk about lead generation on social media, let’s define exactly what we mean when we talk about leads. Leads are, quite simply, potential customers who have expressed some interest in your product or company and have provided contact information you can use to follow up with more information. You can then pass these leads directly to your sales department or engage with them using a tailored content marketing program. If you’re not providing your sales team with a steady stream of potential new customers, you’re doing your business a disservice. And you’re doing yourself a disservice, too, because lead generation metrics are a key way to prove the value of your social marketing efforts to your boss. Perhaps the greatest benefit of lead generation using social media specifically is the ability to focus on highly qualified leads through advanced targeting. 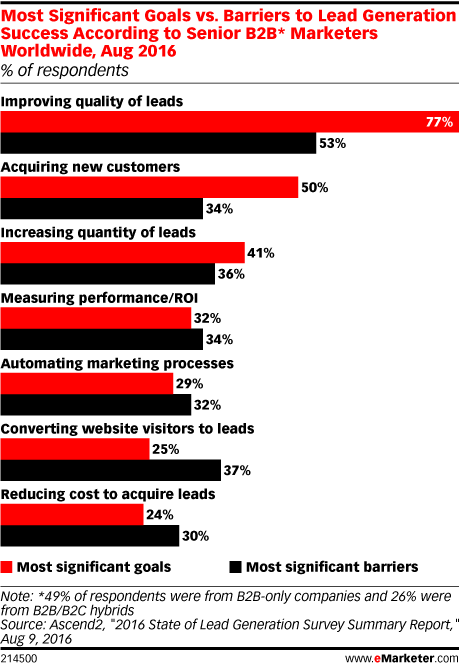 After all, eMarketer analysis shows that improving the quality of leads is the most significant goal for B2B marketers, while simply increasing the quantity of leads comes in third. So how do you go about using social media for lead generation? Let’s look at some of the best ways to start filling the sales funnel for your team. Gated content is exactly what it sounds like—content hidden behind a virtual gate. If the content is valuable enough, interested readers will be willing to provide some basic contact information in exchange for access. Some people who click through to the landing page will click away without accessing your content—maybe they were mildly interested in the information but not so interested that they feel it’s worth sharing their contact details. But those who are truly interested and understand that they will gain significant value are willing to overcome this minor hurdle, qualifying themselves as more than casual readers in the process. Assuming your content is relevant to your product or industry (and it certainly should be), those interested readers who complete the landing page form become great leads. Here’s what a post sharing gated content looks like in action. Promoting gated content directly to your followers is one of the easiest ways to gather detailed information about prospects using social media lead generation tools, so it also plays a secondary role in many of the other lead generation tactics discussed below. Keep in mind that gated content can take several forms, and you should experiment to determine what works best with your particular audience. 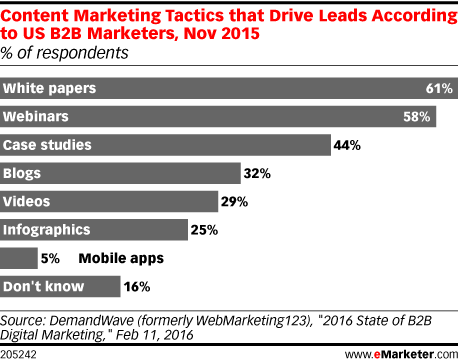 For B2B marketers, eMarketer analysis shows that white papers, webinars, and case studies are generally most effective. Here’s the thing about contests: The prize up for grabs has to fulfill two important criteria. First, it has to be valuable enough that people will actually be interested in entering the contest. But second, it has to be valuable specifically to the people who have the highest potential to become your customers, and not much value to anyone else. After all, anyone might be interested in entering a contest to win a free iPhone or trip to Hawaii, but their contact information is about as valuable as what you would find in a phone book. They have expressed no interest in you, your company, your product, or even your content—just lots of interest in big fancy free things that anyone would enjoy. Enter by retweeting/sharing/liking/following: These are the easiest contests for people to enter, so you’ll likely get a large number of entrants. But since entrants only share the information that’s already publicly available on their social media profiles, this is not a great option for lead generation. And keep in mind that if you regularly ask for likes, comments, and shares, the Facebook algorithm may view your posts as spam and decrease your News Feed distribution. Click through to a landing page: Since this involves an extra step, you’ll get fewer entrants than for a contest that just requires retweeting or liking. However, you can gather information through a contest entry form—as in the IKEA example below—that will turn your contest entrants into qualified leads. While organic social media posts can be targeted to some extent, social media advertising takes targeting—and therefore the ability to collect leads from laser-focused groups of potential customers—to a whole new level. Using highly specific target audiences to promote gated content is a great way to keep advertising costs low while ensuring the leads you collect meet certain desirable criteria. But beyond simple targeting, social media advertising has evolved to include specific social media lead generation tools: ad formats specifically designed to help marketers collect leads directly within social networks. You can connect the generated leads directly to your CRM or mail program, or download them to pass along to your sales team. Looking for inspiration? 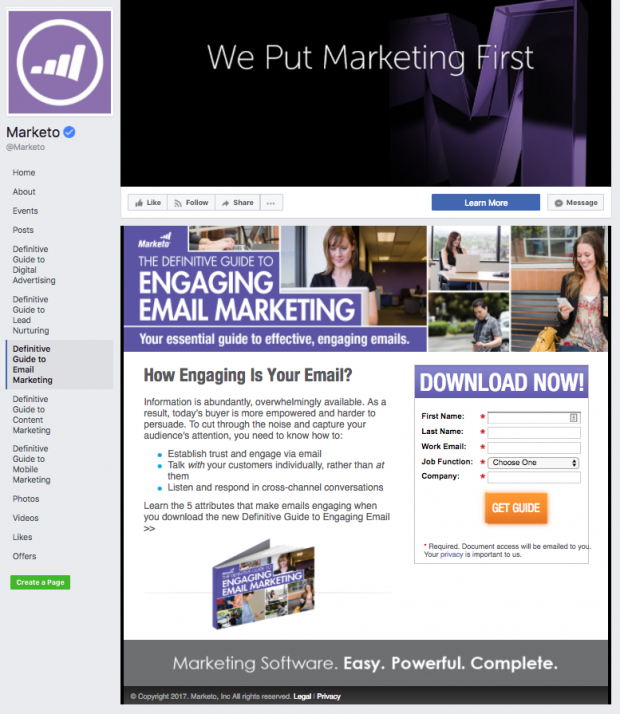 Head on over to our post that highlights seven brands making great use of Facebook Lead ads. Since Facebook owns Instagram, Facebook lead ads can also appear on Instagram, as long as the ads meet Instagram’s design requirements. However, lead ads behave a little differently on Instagram than they do on Facebook. Another key reason to keep it simple? 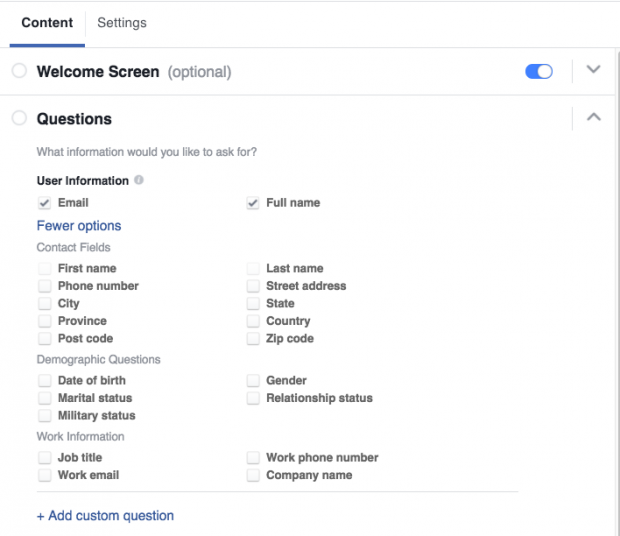 While users scroll down to fill out each lead form section on Facebook, on Instagram each section is a separate screen, providing more opportunities for users to click away. Since LinkedIn is primarily a professional networking site, the pre-populated information can include work details like job title, company, and seniority, as well as education details like degree, school, and field of study, giving you an extremely rich set of data about each lead. That said, LinkedIn recommends sticking to three or four key fields to maximize conversion. Like Facebook lead ads, LinkedIn Lead Gen Forms require no typing at all to complete, making them easy to complete even on mobile devices—which is a good thing, since LinkedIn Lead Gen forms are only available on mobile (and only for Sponsored Content campaigns). Lead Gen forms for desktop and Sponsored InMail campaigns should roll out later this year. LinkedIn Lead Gen Forms just launched in April, but they are already seeing good results. According to LinkedIn itself, 90 percent of the 50 businesses in the pilot project exceeded their cost-per-lead goals. Your Facebook Business Page is a great venue for lead generation on social media. After all, data from the University of Massachusetts Dartmouth Center for Marketing Research shows that among U.S. millennials who follow brands on Facebook, 66 percent do so to get coupons or discounts, and 37 percent do so to participate in contests. That’s great news for marketers, since coupons, discounts, and contests are all great social media lead generation tools. Tabs are basically menu items that appear in the left column of your Facebook Page. Most Facebook Business Pages already use at least some of the standard Facebook Page tabs, such as About, Events, and Photos. But fewer use custom Facebook Page tabs, which can be a great way to highlight contests and offers used for lead generation on social media. If you work with a developer, you can create custom tabs from scratch, but there are also plenty of Facebook Page apps that will help you create custom tabs, including lead generation forms, without knowing any code or investing in social media lead generation software. Image via Marketo on Facebook. We’ve already mentioned that webinars are one of the best-performing types of content for gated content offers. Google+ hangouts and live videos on social media are additional video options that can be used for lead generation through social media. Encourage live interaction by offering a reward for participation, then be sure to follow up with those who leave comments. The follow up could be as simple as directing people to resources related to their comments (including gated content), or you could encourage them to reach out to your team on social media with any further questions. Since these people have already expressed interest in your content and expertise, this simple post-video contact could generate more leads than you expect. Keep in mind that the more specialized or niche your video, the fewer leads you will likely generate, but the more targeted the leads will be. For brick-and-mortar businesses in particular, using social media for lead generation is all about going local. Most local businesses already know about geotargeting for social media posts and ads to reach the audiences closest to their business while maximizing their social media efforts and ad spend. But far fewer businesses are taking advantage of geotargeted social search to uncover local leads. Think about this: You’re managing social media for a chiropractic practice in downtown Vancouver. Who are the greatest leads for that business? Anyone in downtown Vancouver who has a sore back. Luckily for you, a sore back is just the kind of personal detail people tend to share on social (especially if that sore back was acquired by participating in a fun activity like skiing or sailing). Geotargeted social search can help you find these exact people and reach out to invite them to your business or direct them to a special offer lead generation form. Larger or online companies can benefit from geotargeted social search, too. For example, you could use geotargeted search to track the tweets coming from the venue of an industry conference—whether or not you’re actually there. You could then reach out to the people tweeting from the event with a custom offer, like a trial of your app, or just to say hello and establish a connection to develop over time. Twitter advanced search: On the Twitter advanced search page, enter your search terms, then scroll down to Places and select an appropriate geolocation to target your search. Learn more in our post about using Twitter advanced search for lead gen.
Hootsuite: From within the Hootsuite dashboard, click on the search icon (the magnifying glass) in the upper right corner. Enter your search term, then click the compass arrow icon in the right of the search field to find tweets nearby. Hootlet Chrome Extension: Once you install the Hootlet Chrome Extension, you’ll see an option for Tweets Near Here when you click on a location in Google Maps or Yelp. Social media listening is all about keeping a virtual ear to the ground to understand what’s happening in your industry, and who’s talking about you and your competitors online. It’s an important source of actionable insights—including potential leads who are looking to engage with businesses just like yours. By using search streams to monitor important keywords and handles in your industry, you can uncover conversations people are having about relevant products and services, or even specific features. You can then reach out to the people behind these conversations to make a connection, share information that’s helpful (maybe even gated content), and establish a relationship that will position your brand as the go-to resource when they are ready to buy. We’ve got a whole post on how to get set up effective social media listening that shares all the details. Social selling combines elements of social listening, lead generation, and sales practices, but is essentially all about establishing and building relationships. A recent survey by CSO Insights and Seismic found that one in three B2B professionals said that social selling tools increased the number of leads they had to work with. 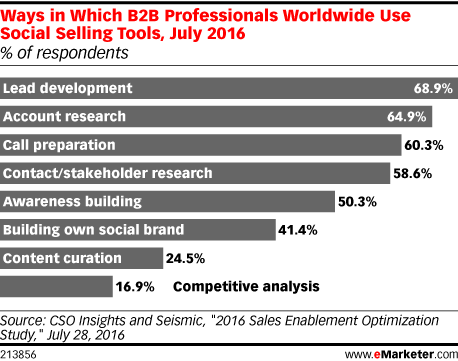 In fact, lead development was the number-one purpose for which B2B professionals said they used social selling tools. Check out the video below for an overview of the key concepts of social selling, or head on over to our post Social Selling: What it is, Why You Should Care, and How to Do It Right for a detailed breakdown of exactly how social selling techniques and tools can be incorporated into your efforts to use social media for lead generation and nurturing. Hootsuite can help you generate leads using social media. Try it free. With files from Evan LePage.